MALAYSIA'S single largest urban development to date, Medini, was officially launched at the GCC's annual property investment event, Cityscape Dubai, yesterday. The catalyst development, previously referred to as 'Node 1', is located in Iskandar Malaysia and is expected to bring in gross development value (GDV) in excess of US$20 billion (RM69.6 billion) over a period of 15 to 20 years. In a statement, Iskandar Investment Bhd (IIB) managing director Arlida Ariff said Medini is Iskandar Malaysia's first sizeable world-class offering to the international property space. "The development is undoubtedly strong in its strategic positioning, government backing, and supporting infrastructure and resources and when you add the invaluable commitment, experience and expertise of our Middle-Eastern partners - we're looking at a winning formula," she added. IIB's Middle-Eastern business partners in the development include Rim City Sdn Bhd (RCSB), Cultural Cluster Sdn Bhd (CCSB) and Mubadala Development Company (Mubadala), with the latter leading a consortium called Global Capital comprising other well-known industry players ALDAR Properties PSJC (ALDAR) and Millennium Development International (Millennium). CCSB is a special purpose vehicle which is majority-owned by Al-Nibras 2 Limited, a Labuan-based private fund company managed by Kuwait Finance House (Labuan) Bhd (KFHLB). The other shareholders are Khazanah, the government investment authority of Malaysia and the parent company of IIB, and Jumeirah Capital. "We decided to capitalise on the exposure provided by the Cityscape platform to launch Medini, and in tandem, open up a limited number of exclusive opportunities within our space here for commitment from keen investors," said Richard Polkinghorne, country director of Millennium. The company, highly experienced in large scale and mixed-use projects, will drive the 146ha International Financial District (IFD) set to be the world-class hub of Islamic Finance in Southeast Asia, with the presence of international financial institutions, banks and corporations. 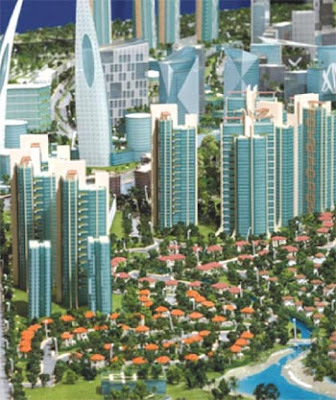 Another segment in Medini known as the Lifestyle and Leisure Cluster is headed by Mubadala, whose plans include the development of 496ha of land into a City Centre, Golf Village, Medical and Wellness Village, Amusement Bay and a Residential District. Lastly, CCSB will undertake 249.6ha in Medini to build the Creative Cluster which will include the Heritage District, Creative Park and Logistics Village. "Malaysia's long-term economic objectives will be strongly perpetuated with every success and progress made in Iskandar Malaysia. The launch of Medini is an important milestone for us, as we are now beginning to unlock our country's true potential to be a globally competitive nation," IIB chairman Tan Sri Azman Mokhtar added. CAPITALAND Ltd, Southeast Asia's largest real estate player, is said to be in talks to purchase three shopping complexes: Ipoh Parade in Perak, Klang Parade in Selangor and Seremban Parade in Negri Sembilan. If the acquisitions go through, they will add to its portfolio of three retail properties in Malaysia, in line with its plans to set up a retail real estate investment trust (REIT) worth over RM2 billion. Sources told Business Times that the negotiations between CapitaLand and TMW Asia Property Fund GmbH & Co, which owns the shopping complexes, are at an advanced stage. 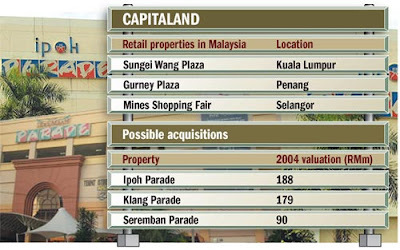 Based on the property valuations undertaken in early 2004, CapitaLand could pay some RM500 million for the shopping complexes. At press time, Business Times did not receive a response from either CapitaLand Ltd president and chief executive officer Liew Mun Leong or CapitaLand Retail Ltd chief executive officer Pua Seck Guan on the said negotiations and whether it planned to buy any or all three properties. TMW Asia Property Fund, a German property fund, bought the three properties - under the operating companies Lion Klang Parade Sdn Bhd, Lion Seremban Parade Sdn Bhd and Lion Ipoh Parade Sdn Bhd - for RM340 million in 2005 from the Lion group. In 2004, Klang Parade was valued at RM179 million, Ipoh Parade at RM188 million and Seremban Parade at RM90 million. The fund is managed by Pramerica, the real estate investment management business of Prudential Financial, Inc from the US. CapitaLand has been on a shopping spree in the past couple of years. It has in its stable the Sungei Wang Plaza in Kuala Lumpur, Gurney Plaza in Penang and Mines Shopping Fair in Seri Kembangan, Selangor. According to previous reports, Seremban Parade has a nett lettable area of 316,847 sq ft and sits on 1.97ha; Ipoh Parade has a nett lettable area of 594,414 sq ft on 4.14ha; and Klang Parade has 696,045 sq ft space. It was recently reported that CapitaLand Ltd might delay the launch of its retail property trust in Malaysia if market conditions worsened over the next few months. Last month, CapitaLand said that it aimed to get approval for the REIT by the year-end.